A playgroup that is unique and full of variety! I have already enrolled my daughter to Steps Playgroup when it was first open. At that time I was browsing around to study the leaflets and course content of different playgroups which I realize that playgroup offered by Steps Education is quite different from others. I could see the playgroup use quite a lot of effort in designing the course content which is quite sophisticated and structured. Moreover, after visiting the classroom, I found the environment is great and spacious for the kids. After attending a few months of lessons, we found that Steps Playgroup has really never disappointed us. Hailey has been progressing very well and she loves attending every lesson there. The lesson design has made her very engaged in each task. Apart from the lessons, teachers in Steps help my daughter to do the ASQ psychological assessment every 2 months and prepare a comprehensive learning portfolio for Hailey which make me understand her strengths, weaknesses, potentials and what she has learnt in class. The thing I appreciate most is the good communication between Steps and us as parents. They will explain the result of the ASQ to us in person regularly and share a lot of good parenting tips with us. From this we know that the lesson design is really based on the development progress of my kid and this can never be done by the other playgroups. Another bonus is that, there are home activities suitable for the development stage of Hailey suggested in the learning portfolio. Hailey is so happy when we do it with her at home! Thanks Steps Education for promoting my girl’s development in all aspects! I am already the mom of 2 kids. When I was looking for a playgroup for my younger daughter, I did not think much and enrolled Steps Playgroup immediately. I first picked here as we were so attracted by the environment of the centre. The classroom is well-lit with natural light and is so much bigger than the other playgroups. I think it is very important to provide a good and spacious learning environment for young kids like my daughter. Joycelyn just loves the classroom as the homey feel classroom gives her a great sense of security to explore and perform the task. I can still remember Joycelyn crawl for the first time at Steps Education! So impressive! 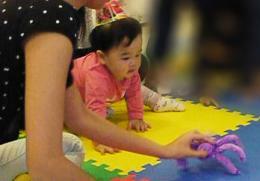 After joining Steps Playgroup, the motor and fine motor development of Joycelyn has improved a lot. Through the stimulation of 5 senses specially arranged in the lessons, my girl’s understand more commands from others and also started to interact well with other children. She can even respond in a friendly way to other children when she is not in class and this is really a significant improvement after attending the class. The most surprising is that, even I am the mom of 2 kids, I still learn a lot from the teachers in Steps in interacting and teaching my own children. The communication between the teachers in Steps and parents is done so well that we understand fully the learning objectives of the tasks and how to further enhance them at home. For example, I discovered that a one year old child should start to use a real cup for drinking instead of a “sucker cup”. If I did not attend the Steps Playgroup, I would have missed this golden period of self-management training for my kid! Whenever I finish my class in Steps, I will continue doing it with Joycelyn at home and she really really improved so quickly!! I realize that giving a kid something suitable for her development stage indeed help them to learn and master skills quickly. 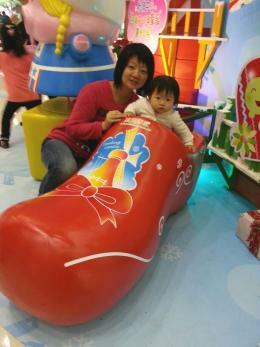 Joycelyn attends the Let’s Grow Up course here and she is indeed growing up so well!